Eyeing farmers support in the crucial Lok Sabha elections, the BJP-led government in Assam on Monday launched the Mukhya Mantrir Krishi Sa-Sajuli Yojna (Chief Minister Farm Tool Scheme) in the backward district of Dhemaji. Assam Chief Minister Sarbananda Sonowal on Monday launched the scheme for farmers at Dhemaji stadium. Sonowal said his government has given topmost priority to economic development of the rural farmers through implementing farm mechanization schemes. “My government is making special efforts for economic growth of the rural farmers. 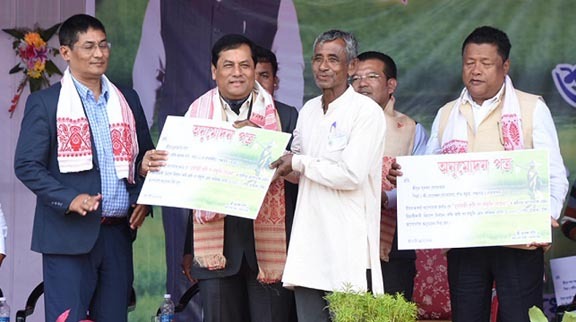 We propose to support 28 lakh farm families of the state and a fund worth Rs 33 crore has been earmarked against it,” Sonowal said, adding that his government is providing opportunity for subsidized agriculture loan for poor farmers. The state government through its Mukhya Mantrir Krishi Sa-Sajuli Yojna for farmers grants Rs 5,000 to the selected farmers (beneficiaries) through account transfer (DBT). The Chief Minister after launching the scheme handed over approval letters to ten selected farmers on the occasion. Assam Panchayat & Rural Development minister Naba Kumar Doley, Lakhimpur MP Pradan Baruah and Dhemaji MLA Ranoj Pegu were also present at the Dhemaji Stadium on Monday for the launch of the scheme. Sonowal said his government initiated the financial aid scheme because the rural farmers survive on their hard work and honest income, and often face financial hardships because of natural calamities. The Chief Minister urged the farmers of the state to send their educated children to avail free training in the government-run Skill Training Centre and build their career in the future. “The state government has set up as many as 240 Skill Development Centres under Assam Skill Development Mission and provides regular vocation training for the educated unemployed youths,” the chief minister added. Later, Sonowal attended a meeting at Gogamukh organized by Mising Autonomous Council (MAC), wherein the newly elected council members were administered oath of office by the MAC principal secretary Pradip Kr Doley. Speaking on the occasion, the chief minister assured sufficient funds to the tribal councils for achieving development activities in their respective areas.